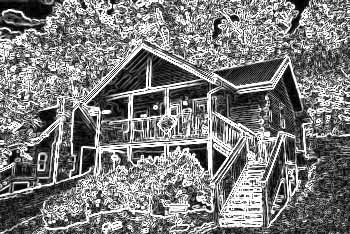 Cabins At The Crossing Resort is an upscale, yet very affordable, cabin rental resort near Pigeon Forge, Tennessee. This resort itself offers convenient easy access to Pigeon Forge attractions, theaters, and dinner shows and much more! This cabin resort offers plenty of great features for a wonderful Smokies vacation. Cabins at the Crossing offers guests a resort swimming pool area with WiFi Internet, shaded seating, changing rooms, and a children's playground. Wide paved streets make the resort easy to travel, and beautifully landscaped grounds and a fishing pond with a water wheel complement the Smoky Mountain setting of your cabin. In addition to lovely grounds, staying in this resort is the perfect choice for vacationers looking for cabins near Dollywood. Being so close to Dollywood and Pigeon Forge means you'll be close to fun activities such as horseback riding, theaters, miniature golf, shopping, dining and more as well. These Sevierville cabin rentals offer guests the chance to enjoy a stay in an comfortable cabin setting that's only minutes from top attractions.